In The First Year, editors of magazines in their first year of publication write about what they are doing and why, and the challenges and triumphs they encounter along the way. Nothing worth doing is easy. Or at least that’s how the long-standing cliché goes. The typical writerly creature loathes clichés – we’re told to avoid them by every single Joe Schmoe with a keyboard, an internet connection and an opinion. The notion is so pervasive that it, in and of itself, has become a cliché. But the thing about clichés, is – they’re a vanilla, dumbed down version of the truth (at least at one time). And in the case of bringing a literary journal like Midwestern Gothic to life, I can certainly see where the expression came from. Who the hell are we, anyway? But how we got there was fraught with many emails, instant messages and phone calls back and forth. Does a story have to be set in the Midwest? Must the author have lived there? What exactly is the Midwestern aesthetic? Those questions persisted and poked at us even after the site was launched and had, in theory, begun accepting submissions. Some of the stories we received helped us nail down what Midwestern Gothic was really about. We had to see it before we knew what it was. One thing I definitely was not prepared for was the sheer amount of submissions. 128, all told. Some of them photographs, some poetry. Most short stories, ranging anywhere in length from two- or three-page scenes to twenty-five pagers. That made for about six hundred pages or so of fiction to read through alone. Sometimes that meant rereading material too. The submission system we used is fantastic, Submishmash, which most literary folks should have encountered at one point or another. So voting, making notes on a piece, etc. was all straightforward. But if Rob and I disagreed on a story, or when the time came to select those last two or three stories, we found ourselves with several that we had to weigh and re-weigh against all the others. The fact that the publishing industry has been flipped on its head is not news to anyone. eBooks, Facebook, twitter and blogs have all made it simultaneously easier and harder for someone with no publishing experience to jump into the marketplace. Designing all the assets we needed to do things the way we wanted had to be done from scratch. Everything from the buttons on the website, to the copy for our submissions page, to our blasted twitter background (which I still need to re-do, by the way), adds up. I come from an advertising background, so I know enough about design to be dangerous. More often than not, I suffer from the malaise of seeing something in my head, but not being able to make it come out on paper. But the little things that normal folks don’t pay attention to when reading a book all have to be thought through and solved for. Like the size and type of the font. The layout of the table of contents page. The fact that the copyrights page starts on the right hand side of the book versus the left. And we’re still working through them as the publication of the first issue fast approaches. They’re so good, they make it look easy. Another cliché. Hopefully one that gets used when people see the final Midwestern Gothic product. Because if we’ve done it right, none of these challenges or road bumps show up when the book lands in the reader’s lap. In a way, the biggest challenge is staying out of the way of the stories and poems, because that’s all the reader truly cares about. And that’s really the biggest challenge of all. 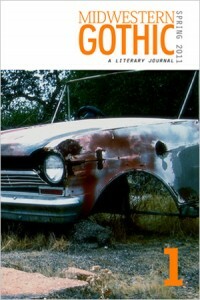 Jeff Pfaller is co-founder of Midwestern Gothic, a literary journal that aims to collect the very best in Midwestern fiction writing, cataloging the oeuvre of an often-overlooked region of the United States ripe with its own mythologies and tall tales.